Stacked bags of rock salt loomed high in a dim, cavernous room, where the stale smell of diesel exhaust from hulking delivery trucks lingered long after they were parked for the day. 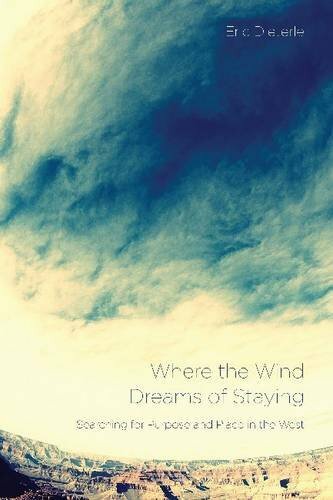 -- Where the Wind Dreams of Staying: Searching for Purpose and Place in the West by Eric Dieterle, published by OSU Press. This new memoir is as much a tribute to the inland West as the story of the man shaped by his western environment. Sounds very poetic for a memoir. Even the title is poetic. Hope you enjoy it. Whilst the genre of book doesn't really appeal to me personally and I think the title is a bit too long, the cover art is really evocative and the full premise is very alluring. I can imagine that you will really enjoy this one! I like the title and the cover is beautiful. I know nothing about the author, but the book sounds very interesting. I'm looking forward to your review. I just pictured the scenery. Great opening! Sounds like the winter storm going on right now. This looks interesting and the cover is gorgeous. I hadn't come across this book before but I love a really descriptive beginning! The cover is pretty. I've never heard of this book before. The description is great though. Thanks for hosting. Have a great week and happy reading. I hope you enjoy your book. I am not much into memoirs, but the cover and title are absolutely beautiful.